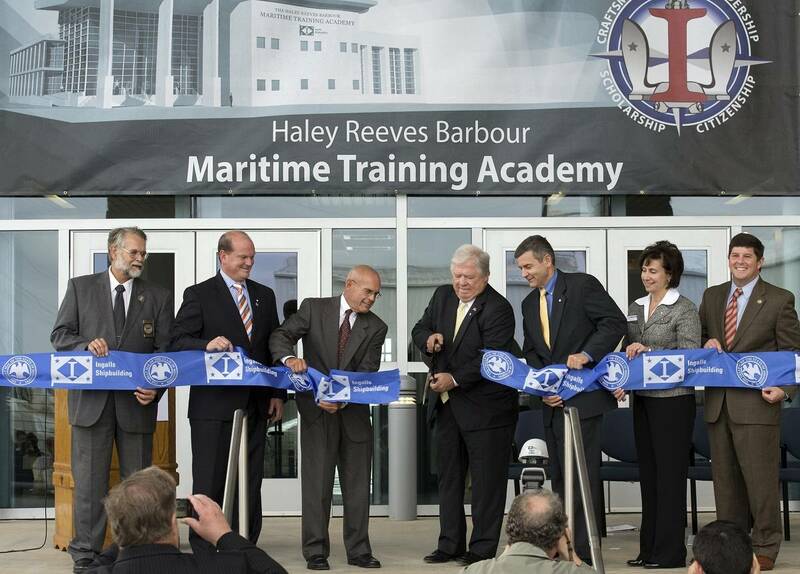 Huntington Ingalls Industries' (HII) Ingalls Shipbuilding division officially opened the company's brand-new, 70,000 square-foot Haley Reeves Barbour Maritime Training Academy today with a ribbon-cutting ceremony. The building, named for the former Mississippi governor, will serve as the training epicenter for Ingalls' apprentice program and will also help bolster the number of students. "Today symbolizes the state's commitment to workforce development and skills training for all of our working people so they can get better, higher-paying jobs," Barbour said. "This will be a symbol to students in Jackson County, south Mississippi, our whole state that the trades and the crafts provide wonderful careers that are rewarding and fulfilling. For many men and women, boys and girls, that's what their special talent is. We've got to start earlier in their lives, exposing them to the trades and what will be taught here." The building, a framed, two-story facility, has the feel of a college campus. It features 24 classrooms, three computer labs, a library, a bookstore, 26 offices/conference rooms, as well as several craft labs for the shipyard's various trades. "This new Apprentice School facility will be instrumental in training future generations of shipbuilders," said Ingalls Shipbuilding President Irwin F. Edenzon. "Ingalls Shipbuilding and all of Huntington Ingalls Industries understands, as the governor does, that the most important investments we make are in our 'human capital.' We invest in craftsmanship, scholarship, leadership and citizenship because it makes us a better company and a better employer, and it's the right thing to do—just as the state's investment in these things helps make a better Mississippi. And it gives everyone the opportunity for a better quality of life." Starting in January, there will be approximately 400 students enrolled in Ingalls' apprentice program. Currently, more than 60 faculty and staff deliver 14 different trade programs and more than 120 course offerings that enable apprentices to gain not only the skills, knowledge and pride of workmanship, but also the educational foundation and personal qualities needed to fully meet the challenges of a shipbuilding career. "This partnership between government and industry is bigger than just one company," said HII President and CEO Mike Petters. "This is about a partnership that drives the economic backbone of the entire state. Shipbuilding is an opportunity to participate in something that is much bigger than you. We build ships that when they sail down the river, they go out and make history for 30 to 50 years. And we know that our products will be carrying the treasure of American society throughout all those decades. And we're proud that we have a chance to be a part of that, and this academy will play a major role in that." Since 1952, Ingalls' Apprentice School has produced more than 4,000 graduates in support of the shipyard's operational needs. Today more than 1,500 apprentice alumni fill approximately 50 different types of jobs at Ingalls, from pipe welders to senior executives. 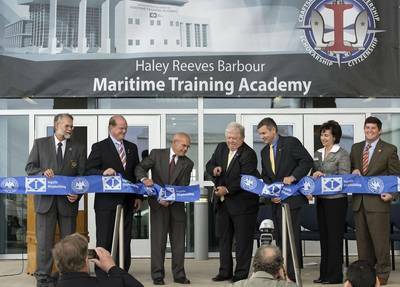 "Congratulations to the Ingalls Shipbuilding family on the dedication of the Haley Reeves Barbour Maritime Training Academy," Mississippi Gov. Phil Bryant said. "This training academy will ensure that the next generation of shipbuilders in Mississippi maintains the world-class shipbuilding reputation built right here at Ingalls." Ingalls' apprentice program offers a comprehensive two- to four-year curriculum for students interested in shipbuilding careers. Ingalls is also entering into a new phase of partnership with the Mississippi Community College System to fully accredit apprentice courses and offer a bridge into degreed programs. "This is an exciting time for the partnership between Ingalls Shipbuilding and Mississippi Gulf Coast Community College," said Dr. Mary Graham, president of Mississippi Gulf Coast Community College (MGCCC). "The Maritime Training Academy is an example of innovative thinking and an innovative approach to education. Not only will it advance students' education, but it will advance their careers. And that's what workforce training is all about." Mike Mangum, president of the Jackson County Board of Supervisors, also spoke. "We are proud to partner with the State of Mississippi, Ingalls Shipbuilding and the MGCCC in this newest milestone," he said. "Huntington Ingalls is the model of good corporate citizenship and makes up part of the backbone of our economy."